San Francisco: Not since the hatchback demise of the 70s, the advent of the minivan in the 80s, and don’t forget the current SUV craze, has the wagon been such a popular vehicle of choice for people on the go and for families to get going. 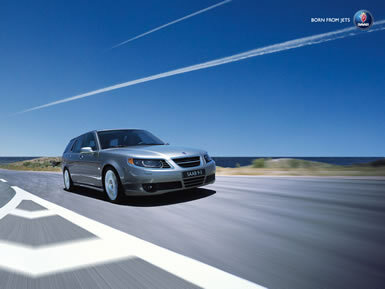 If only they made wagons like the Saab 9-5 SportCombi back in the 80s and 90s. This resurgence of the wagon could be attributed to many different factors, too many for us to discuss here, but we feel that their usefulness in cargo- and people-carrying ability and the fact that most wagons get better mileage than either vans or SUVs have pushed the wagon back into the limelight. Saab redesigned the 9-5 line for 2006 by revamping the front and rear fascias, fenders, tailgate and trunklid and making the side moldings and door handles body-color. In a sense of downsizing, the 9-5 will only be offered as a sedan and our tester SportCombi for 2006. Gone are the Linear, Arc and Aero designations as are engine choices. For 2006, you can get any engine in the 9-5…as long as it’s the 2.3-liter turbocharged inline four-cylinder that makes 260 horsepower and 258 lb-ft. of torque. And we can tell you that it’s as potent in real life as it looks on paper. EPA figures for city and highway area 19/28 for the automatic. We got 20 miles per gallon in mixed use and with a heavy foot. Changes to the 9-5 include chrome surrounds to the headlights and smoothed lines across the front of the vehicle, making it look fresh and invigorated. Inside, you’ll find a handsome interior in fine leather and walnut trim all around. The dash is clean and the gauges are easily read but the center stack has a few too many buttons to control the radio, climate and navigation system. After a few days of use, though, it all became familiar and we were thankful Saab hasn’t gone to the integrated systems that BMW and Mercedes use. Since this wagon has such a sporty look, we were very happy that the seats were sporty as well, with decent bolstering and a firmness that only European vehicles seem to do well. Our only complaint with the driving experience was a stop pedal too close to the go pedal. Both are canted to the right, but not uncomfortably so and we found that we had to watch as to not hit the brake when going for the gas. Out on our handling loop, the car handled like a small front-drive sports car in the tight twisties. Turn-in is excellent and grip is prodigious, making you forget you’re driving a station wagon. There is a bit of front-end plow in tight corners with the back end coming around at the right point to get you through. Front drive in a vehicle like this makes sense and Saab engineers have made the most of this set up. We can only imagine what they might do with an all-wheel-drive version. Manual mode on the transmission works great in the hills and tight curves but doesn’t make much sense in normal driving. The turbo spools up quickly and negates the need to downshift in a lot of situations. This 2.3 turbo engine is one strong performer! One little criticism about the folding seats … why do the manufacturers insist on making the seats in such a way that they won’t fold flat? You can get a lot of stuff in the back of the 9-5 SportCombi but, since the floor isn’t flat, you’re limited in exactly what you can carry. Base price for the 9-5 is $35,820, which includes 17-inch wheels, traction control, electronic stability control, ABS, power moonroof, heated front and rear seats, heated out side mirrors, dual-zone climate control and Harman-Kardon 200 watt eight-speaker radio. Our tester also came with the Sport package ($1095 - leather seats, lowered sport-tuned chassis and tinted-chrome interior trim), The Visibility package ($1295 - xenon headlights, rain-sensing wipers, Saab Park Assist and auto-dimming outside mirrors), a cool shade called Fusion Blue Metallic, which cost an extra $550, navigation system with trunk-mounted six-disc CD changer ($2795), OnStar ($699), and the automatic transmission ($1350) for a grand total of $43,604.00.